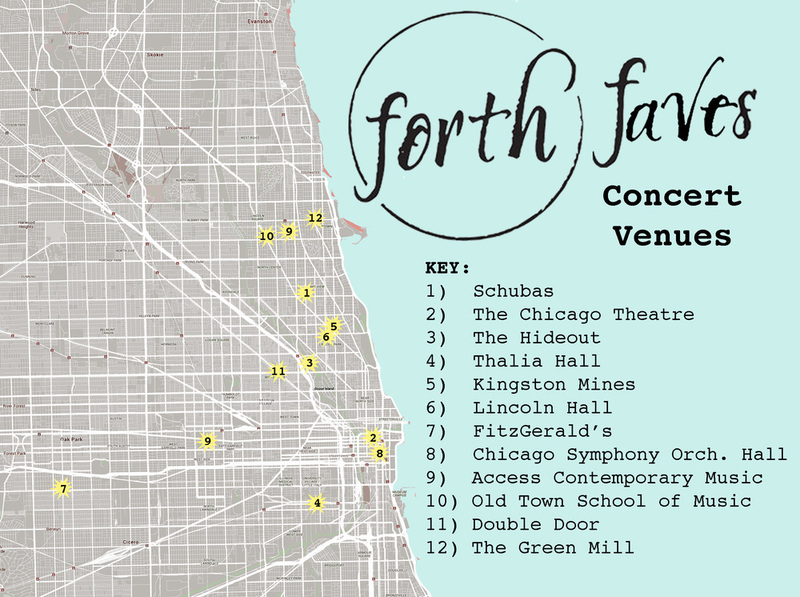 Taking a cue from Clare Johnson's Forth Favorites post last week, I digress from our eat-your-way-through-the-city maps and bring you some of Chicago's top places to catch your favorite band, discover a new group or just rock out to some live music. Not to worry, the food favorites will resume very soon, but until then go check out some of the coolest concert venues in the city. I saw a concert here this week and think I found my new favorite venue in the city - the concert hall is attached to Schubas bar and has a max capacity of about 160 so is one of the most intimate settings to see a show in the whole city. Fun fact via Rolling Stone: the co-owners of Schubas had a hand in launching the careers of Dave Matthews and Feist. Nothing beats a snapshot in front of the iconic "Chicago" sign on State street with your favorite band's name in black and white letters above. The theatre itself, which was called the "Wonder Theatre of the World" when it opened in 1921, is, needless to say, stunning and hosts a variety of concerts and shows. The Hideout is a tiny little dive bar, off the beaten path, but well worth the trip. Nestled in the middle of the Elston Ave industrial district, between Goose Island & Lincoln Park, this venue is a gem for live music & good beer. This is a great spot to see new & established independent bands, with music ranging from honky-tonk & rockabilly to punk & rock (and everything in between). We especially love when Forth-er Annie Higgins, of Weatherman, plays here! Nestled in the heart of Pilsen, this theater is spacious, yet brings in acts that continually fill it to capacity. It's also right next door to two of our favorite Forth-Approved spots in the city - Dusek's and Punch House- which makes for a delightful evening of good food and great music. This blues spot consistently makes top Chicago must-do lists and for good reason - open 7 days a week, with 2 stages and music often playing until 3 and 4 in the morning, you'll most definitely get your money's worth and maybe even spot a celeb or two. The bigger, little sister of Schubas, Lincoln Hall is about 5 times the size of Schubas, but hosts an equally stellar lineup. With everyone from indie rockers to hip hop artists to bluegrass bands coming through their doors, and a very similar vibe to Schubas, this place should be at the top of your upcoming concert watch list. Built in the early 1900s, you might know FitzGeralds from the roadhouse scene in A League of Their Own, kids singing the blues in Adventures in Babysitting or as the setting for Bon Jovi's "Lost Highway" video. This legendary local spot features a ridiculous range of live music from teen open mic nights to cover bands to well-respected touring acts. This venue is truly breath-taking and beautiful inside, with a similar feel to the Chicago Theatre, only right across the street from the Art Institute. But just a heads up, you can buy drinks in the lobby, but can't bring them into the theater...downing a glass of wine in order to not miss the opening act is not advised- lesson learned. ACM is all about showcasing contemporary classical music, so put this place at the top of your to-do list if you're trying to expand your musical horizons. Old Town School of Music is, you guessed it, a great place to actually learn how to play music (i.e take lessons..Julie divulged in her 4xForth that she nearly learned how to play the ukulele), but also hosts concerts. Patti Smith is coming next month...see you there? Located at the Six Corners intersection in the heart of Wicker Park, Double Door supports local acts and also brings in world-known rock stars. The venue has a downstairs bar called The Dirtroom which hosts acoustic shows and comedy gigs, as well. Jazz, jazz and some more jazz with a side of jazz. A heady blend of authenticity, history, swank and Deco grit await you at the Green Mill. Get there early on Sunday nights for the Uptown Poetry Slam, an absolute cultural institution in Chicago.